The old classroom saying goes, “In fourteen hundred ninety-two, Columbus sailed the ocean blue.” A picturesque mental image of an old-world ship peacefully sailing into what would become the United States of America usually accompanies this saying. But this is only a romanticized fraction of the story. A Native teacher and student exercising a hands-on learning approach - a technique modern American schools are now adopting. According to Dr. Alberta Yeboah, an associate professor of social science at Jackson State University, Native Americans had already established a functioning, effective educational system long before European contact was made. The system was composed of teaching Native children the “knowledge, values, attitudes, skills and dispositions required for successful functioning adults in real world settings.” This included a foundation of a reverence for nature, along with a sense of human responsibility toward protecting and respecting nature. After Europeans arrived in 1492, a Eurocentric educational system was imposed in order to force Natives to “assimilate” into Euro-American culture, despite the fact that Native people were there long before the Europeans began to settle. The Europeans felt that they must “save” the Natives of their traditional ways, despite the fact that they already had a working system in place, and had already lived there for thousands of years previous to the “discovery” of America. It is estimated that when Europeans arrived in 1492, there were between 50-100 million Natives in North America. This number was reduced to about 250,000 by the 1850s. This sharp decline was due to the countless wars that Europeans waged on the Native population, intentional infections of smallpox and yellow fever, and massive destruction of the Native people’s agricultural livelihoods, enslavement, and incarceration (Yeboah, 2005). Boarding schools for Native children began in 1860. The schools were put in place as a tool to “assimilate” Native tribes into the mainstream “American way of life.” These schools were built on reservations, and the end goal was to eradicate all that remained of Native culture. After nearly 20 years of boarding schools being located on reservations, a new, nefarious school of thought was introduced by Richard Henry Pratt: “Kill the Indian, save the man.” In 1879 Pratt opened one of the most infamous off-reservation boarding schools, located in Pennsylvania. 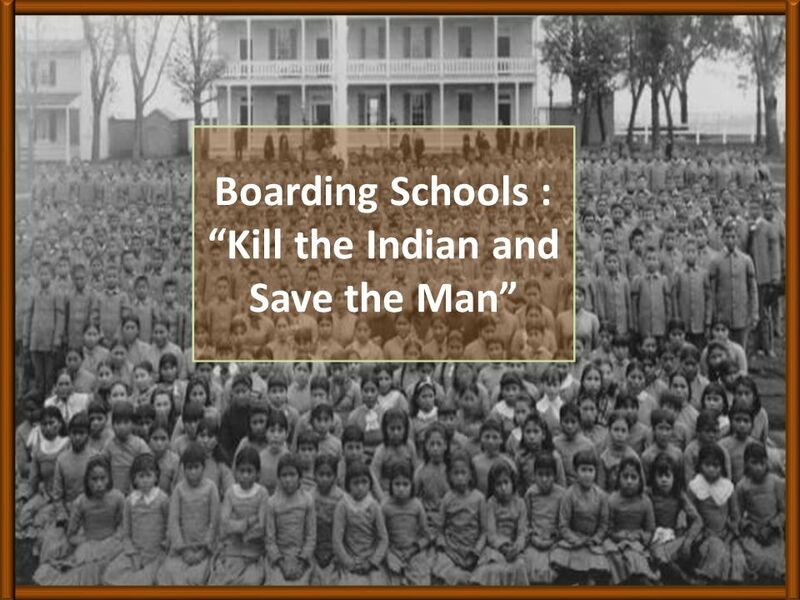 According to Northern Plains Reservation Aid (NPRA), this style of boarding school aimed to destroy all aspects of Native culture, especially outward signs of tribal life that the children brought with them. Native children were forced to cut their hair, change their names to English names, abandon their native food, and forbidden to speak in their Native languages, even to each other. These schools taught history with an explicit white bias. Discipline within these schools was severe and consisted of confinement, deprivation of privileges, corporal punishment, and restriction of diet. These schools were also ravaged with diseases such as tuberculosis (which still remains an issue), and epidemic proportions of measles. At this time, at one school in a 10-day period, there were 325 cases of measles, 60 cases of pneumonia, and 9 deaths. Native parents resisted the schools in various ways. Entire villages would refuse to enroll their children in white schools. Government agents on the reservations would in turn refuse or withhold rations, or would send in police to enforce the school policy. It wasn’t until 1978 that the Indian Child Welfare Act gave Native parents the legal right to deny their children’s placement in off-reservation schools. With the historical abuses the Native population has faced, it is no wonder that they are still dealing with the repercussions of these horrific acts against their people. Alcohol was also introduced to the Native population during the 1800s, a problem which still plagues them with Alcoholism death rates 514% higher than the general population, and chronic liver disease and cirrhosis rates 4.8 times higher. Not only are the aforementioned alcohol problems worse, so is their mental health. According to the Aspen Institute and the US government’s Indian Health Service, suicide rates are more than double in the Native population, and Native teens experience the highest rate of suicide among any population group in the United States. It is the 2nd leading cause of death (and 2.5 times the national rate) for Native youth in the 15-24 age group. Historical displacement is still causing a ripple effect, as the NPRA states that 90,000 Native Americans are homeless or live in unsafe and substandard housing, and 23 percent of Native families live with low food security. Holbrook Indian School opened its doors in 1946 as a one-building mission school by the Seventh-day Adventist Church. The property totals 214 acres in a quiet area of Arizona and rests on an aquifer to ensure sustainability. While the school has gone through changes and growth, the mission is the same: Through a Seventh-day Adventist perspective, Holbrook students grow in the Creator while also preserving and celebrating their Native culture. Holbrook Indian School is not about killing the Indian. It is about helping students reclaim their identity. Because students face many of these issues regarding mental and physical health, Holbrook practices a slightly different approach than many other schools. Through the NEW (Nutrition, Exercise, and Wellness) You Initiative, students experience the four pillars of whole-person care through MAPS - Mental, Academic, Physical, and Spiritual health. Mental health services are provided to those students who seek it out, or to those in whom a need is seen. A licensed clinical social worker lives and works on campus, providing students with professional, evidence-based, Christian mental health care, therapy, and counseling. Holbrook is the only Adventist school to provide this on campus. Academics are another highlight at HIS. At the beginning of each year, students are placed where they are comfortable in excelling, instead of automatically putting them in a certain grade based on their age. This allows each student to grow in his or her educational journey, and helps improve grades and retention. Once students complete high school, Holbrook offers a one year post-high school graduation transition program. On top of that, students are assisted in navigating the application processes for colleges and scholarships. Holbrook students explore scenic sites like Canyon de Chelly through HIS’s Outdoor School program. Physical health is addressed through many different programs, such as horsemanship, physical education, gardening, and various sports. Spending time in nature and reconnecting with the Creator is a favorite past-time. The Outdoor School program is more than just going outside the classroom; it's actually going camping and holding school in various national parks. The aim to create a learning environment where healing and engaging students extends beyond academics to putting them in nature. It's so much more than just stepping outside the classroom on a sunny day. Students go camping and study in a native environment. Places of historical significance and beauty like Canyon de Chelly National Park are explored. Mountain biking, swimming, hiking, trekking - these are all outdoor activities the students love. Last, but most definitely not least, is Spiritual health. Holbrook Indian School believes in spiritual well-being. Holbrook provides a safe space for students with spiritual guidance. A 24-hour period of homework-free, work-free, stress-free healing each week is encouraged. Students are emboldened to connect to their Native culture and traditions through things like art, pottery, and nature. At Holbrook Indian School, each student should feel welcome, safe, and is treated with the utmost respect. People and culture are respected. Holbrook is here to help improve the journey of life for the Native population, and to ensure that each student feels the love of their Creator in their personal lives. The languages they spoke were once forbidden. Those same languages were then used to save our nation. In World War I and World War II, Native American soldiers spoke in their respective languages to relay strategies and secrets to each other. The Choctaw tribe was the first to pioneer this strategy. These brave men were known as Code Talkers, and in World War II, Navajo was the most commonly used language for code talking. But when it came to practicing their culture and speaking in their tongue, Native Americans faced hundreds of years of intolerance. As a country, we have come a long way for celebrating diversity. But we also have a very long way to go. One of the missions of Holbrook Indian School is to help Native students celebrate and retain their cultural identities and languages, while learning and growing in a Christian environment. Zak Adams is a teacher at Holbrook, and is dedicated to helping students connect with their culture through pottery. He is also teaching a new class this year called Indigenous Arts. Art, Zak says, has a special way of reaching students. Holbrook also provides students with Navajo Language and Navajo Government classes. Both of these are taught by Sam Hubbard, who has been teaching 7th to 12th grade students full time for seven years. Sam is Diné, which means “The People”. This is how members of the Navajo Nation refer to themselves. At Holbrook Indian School we are committed to every aspect of our students well-being. We take the MAPS approach to wellness: Mental, Academic, Physical and Spiritual health. We believe by demonstrating to them a balanced approach to living they will have better lives.